We step off the plane at Honolulu International Airport and I immediately take a deep sigh of relief. We are back in the Hawaiian Islands. The warm air brushes my skin as the doors open to the long corridors and the sun greets us with its warm, welcome rays. I feel a million miles away from damp and frigid Seattle. This time our annual winter visit to the Hawaiian Islands has us exploring more of the island of Oahu and reviewing the Disney Hawaii Resort, Aulani, A Disney Resort and Spa for the first time since its opening. Aulani opened in August of 2011 and recently underwent a renovation, adding the brand new Ka Maka Landing, including a new infinity edge pool, splash zone for tiny tots and Ulu Cafe, offering grab and go food and quick service breakfast, lunch and dinner. Check out “Anne at Aulani”, a Disney Hawaii Resort, Aulani video review (above) to see what it is like to experience Aulani as a family. So many extras are included in your stay at Aulani, including Disney entertainment and experiences for kids of all ages, childcare and villas with full kitchens (and washer and dryers), making this a great luxury Hawaii vacation value for families, especially with younger kids. The oceanfront at Aulani in Ko ‘Olina, is miles away from the hustle-and-bustle of busy Waikiki beach, offering a tranquil oasis for families. Aulani sits on a protective cove about 30 minutes north of Waikiki and is an ideal location for an immersive family vacation that includes many of the “extras” families with young kids need to have a great vacation. 1. Splurge on a 1, 2 or 3 bedroom villa. The best way to experience the best of Aulani for families starts with booking a villa. The villas offer all of the amenities of a standard hotel room, with the additions of full kitchens (with the added bonus of a rice cooker!) to cook homemade meals, spacious eating areas and separate bedrooms for sleeping. Villas accommodate from four to 12 guests, making it a perfect fit for multigenerational travel or families traveling together. 2. Stop for light groceries in Ko’olina. This is our go-to money saving tip for Hawaii travel. We stop by the local Walmart to grab basic supplies – water, breakfast cereal, milk, snacks and Mai Tai fixings for mom and dad. For meals cooked in your villa, visit Foodland for a delicious selection of ahi poke and fresh fish. 3. Spend your first day at Aulani by the pool. You will be in awe by Aulani’s magical water playground that is so magical, it has it’s own name. Waikolohe Valley is home to three large pools, water slides, splash zones for kids, and our personal favorite, a lazy river. Hawaiian for “mischievous water,” Waikolohe Valley at Aulani will provide hours (and days) of entertainment in the warm Hawaiian sunshine. My kids couldn’t get enough of the two water slides and snorkeling Rainbow Reef. End your day by watching the epic Ko’olina sunsets over the new infinity edge pool in Ka Maka Landing. In keeping with Disney’s tradition of storytelling, the new Ka Maka Landing brings to life the legend of Māui, the great trickster demi-god, known to generations of Hawaiians through the re-telling of cultural legends. 4. Enjoy daily (included in your stay) Disney entertainment. 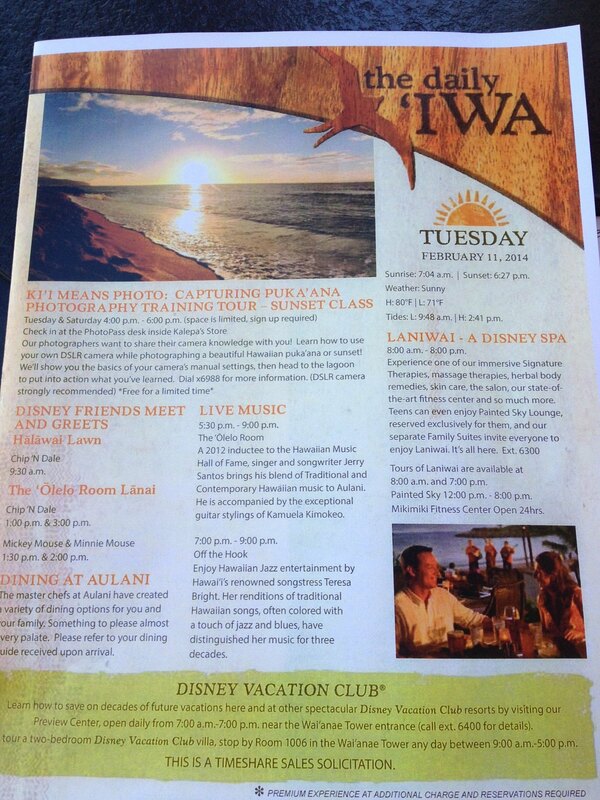 When you check in to Aulani, you will receive a “Daily Iwa outlining all of the great activities and entertainment options available complimentary to guests. The Starlit Hui and Ohana Family Outdoor Movie Nights were two of our favorites and provided endless days of fun for us as a family. 5. Check the kids in at Aunty’s Beach House: If you have younger kids like us, you will be so grateful for Aunty’s Beach House. Drop the kids off for a an hour during the day to enjoy the Laniwai spa, or date night. At Aunty’s beach house, the kids will play, enjoy dinner and be entertained Disney style, while you two can enjoy a romantic sunset dinner at nearby restaurant, ‘Ama ‘Ama. Tip: There are some scheduled entertainment events at Aunty’s Beach House that require same day advance reservations and are on a first-come-first-served basis. You will want to grab a quick cup of coffee and get in a short line at at Aunty’s Beach House around 7:30-8am to be there when they open to reserve your kid’s spot for the day. 6. Indulge in a relaxing water playground at Laniwai Spa. I found my two hours at Laniwai, which means “freshwater heaven” in Hawaiian) incredibly grounding and one of the best spa experiences I’ve yet to try. Ever detail is considered in classic Disney style, down to being able to select your own music for your spa treatment. Laniwai’s design explores the cultural and even spiritual significance of rainbows, combining beautifully reflected light, brilliant color, and healing water features. You can definitely feel the focus on reconnecting with nature and yourself. What made this a very personal and magical spa experience for me was the way they bring you into the spa. Each guest draws a stone with words on it and it is “your word” to meditate on during your stay. No surprise, my word that came up was “balance.” You cast the stone into this beautiful, circular stone pond, letting go and ready to enjoy your journey into relaxation. Laniwai has more than 150 treatments, including the only outdoor hydrotherapy garden on the island of Oahu and a dedicated teen spa, Painted Sky youth spa, featuring relaxing treatments created especially for teens. Aulani is a truly beautiful, Hawaiian luxury resort for a one-of-a-kind vacation destination to unplug and enjoy a touch of Disney magic and storytelling. For these parents of younger kids, having the one bedroom villa with full kitchen inside a Hawaii resort with all of these little extras made for a very relaxing and low impact way to vacation on Oahu! Stay tuned for more on experience at Aulani here and on Expedia Viewfinder. What are your favorite activities to experience Aulani with your family? Disclosure: We were guests of the Disney Aulani Resort and Spa and received complimentary accommodations during our stay. As always, opinions expressed here are our own.